Ensure a great user experience and monitor complete online processes (e.g., the complete check out process, not just store uptime). Only AlertFox's browser-based real-user monitoring solution can test function and performance of sites that rely on any of the major rich internet applications (RIA), including ActiveX, AJAX, Flash, Flex, complex HTML and Silverlight technology. Monitor and improve your site usability and increase conversion and revenue. As the first synthetic monitoring service that can monitor web applications with Flash and Silverlight applets, AlertFox is able to monitor sites like YouTube or Google Docs that previously were not candidates for these types of services. Furthermore, this real-user monitoring runs directly in the web browser, thereby monitoring the true user experience. AlertFox constantly monitors web applications, alerting owners to problems that other monitoring services overlook. And since AlertFox is offered as a service there is no internal software to deploy and maintain. Best service for multi-step web application monitoring. New: Receive screenshots when errors are detected. - see what your users see! Unique: Flash performance monitor & image recognition. Based on iMacros, the leading web browser automation tool - free license for our users. Did we mention that even with all these features our PRO accounts costs less than any of the "big -name" Web 1.0 website monitoring services? AlertFox includes detailed error reporting, so you can determine exactly why your website failed and quickly correct it. Note that a 3rd party component error as shown in the screenshot above ("Waiting for widgets...") is not available to classic monitoring services, as it only appears inside an actual web browser. Does AlertFox really work with Flash applets? Yes, it does. 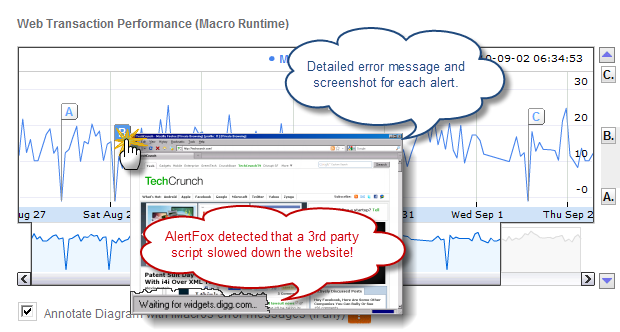 AlertFox uses the iMacros DirectScreen technology to automate and monitor Flash applets directly inside the web browser. The response time measurements always reflect the true user experience because only AlertFox uses real IE and Firefox browsers and the original browser plug-ins such as Adobe Flash Player, Microsoft Silverlight and SUN Java runtime. Currently we accept Visa, MasterCard, American Express and PayPal. If you prefer to pay via Purchase Order (PO), invoices or another payment method not listed here, please email sales to arrange this. AlertFox has full AJAX support: Many AJAX elements are already supported by the HTML based recording available in the iMacros for Firefox add-on. For some tasks, such as monitoring AJAX drag & drop you can use the iMacros DirectScreen Technology, which is available in our PRO2 and PRO3 accounts. If you have questions about AlertFox or the sign up process just submit a support request and we’ll get right back to you. No. AlertFox is a pay-as-you-go service. There are no long term contracts or commitments on your part. You simply pay month-to-month. If you cancel, you won’t be billed again. Why is AlertFox so much cheaper than other website monitoring services? Good question! Alertfox is able to offer very competitively priced PRO accounts because it uses self-service script creation based on the popular iMacros browser add-ons of our parent company iOpus. AlertFox users can use this innovative technology to create transaction monitoring scripts that run directly in the Firefox or Internet Explorer web browsers. Also, they do not have an unnecessary network of hundreds of global monitoring stations. We have proven that six globally distributed centers (in Asia, Europe, and North America) are more than enough. Real Browser Monitoring: What is real browser monitoring? With our real browser monitoring you can run complete multi-step and multi-page sequences (“transactions”) in real browsers, e.g. perform complete store order processes, file uploads and downloads, or verify that movie plays correctly in a Flash player. AlertFox is the only service that supports transaction monitoring with real Firefox and Internet Explorer web browsers.